By signing this petition, please support the initiative of the Calgary Tesla Society to raise a statue to Nikola Tesla at the University of Calgary Campus. Nikola Tesla was a man with an ultimate dream to provide free electricity for all humanity. With his numerous inventions, he has not just improved but made possible life of common people in the modern era. The intention of raising a statue to a great inventor and humanist is to inspire young people to think big and selfless, as Tesla did, on important enterprises like energy and its wireless transmission. He is the best role model to students, future engineers and physicists, scientists, researchers and inventors. Tesla is the father of the modern alternating current (AC) electricity supply system, radio, wireless technology and many more crucial inventions. University of Calgary supporters of that initiative are: Schulich School of Engineering, Department of Physics and Astronomy, and Electrical, Computer and Software Engineering Student’s Society. 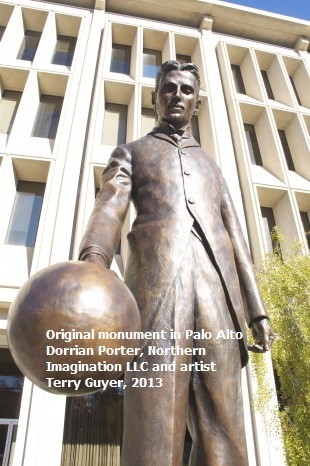 The bronze tribute created by Terry Guyer, renowned sculptor and painter, features Tesla holding a wireless light bulb.The proposed location is a site between ICT (where the Electrical, Computer and Software Engineering is located), Science B (where the Department of Physics and Astronomy is located) and the Engineering Complex. Please share this petition with your community by printing this poster. Nikola Tesla : "The present is theirs; the future, for which I really worked, is mine." Calgary Tesla Society needs your help with “Tesla statue at the University of Calgary Campus in Calgary, Alberta, Canada”. Join Calgary Tesla Society and 2,113 supporters today.